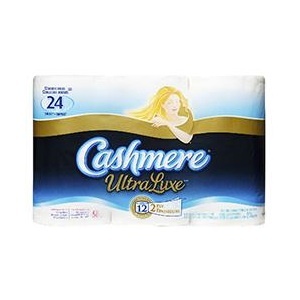 On Checkout 51’s list this week (Sept 19-25, 2013) is Cashmere UltraLuxe Bathroom Tissue, any Cashmere UltraLuxe Bathroom Tissue. Nothing feels like Cashmere. With an extra layer of quilted softness, Cashmere Ultra 3-ply is our thickest, most luxurious bathroom tissue ever. This quilted 3-ply is so thick and so irresistibly soft, it deserves to be called Ultra. Hypoallergenic and dermatologist approved. Safe for septic and sewer systems. You will get $1.00 cashback rebate at Checkout 51. Here’s a pic of what it looks like. I found a couple prices of it at a few stores.